We recently acquired a pizza stone, so Sunday dinner equals pizza these days. Sadly #1 sprogget doesn’t like normal pizza, nor white with just cheese, so I’ve had to make her a “pizza with nothing” ie a pita bread. 10 minutes of machine kneading, rest for 50 minutes or in fridge overnight. Venison again? Yes. 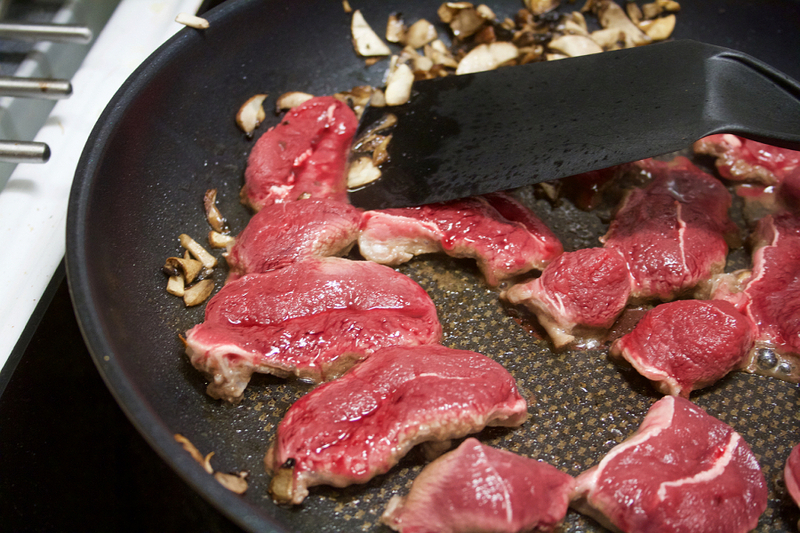 The grocery store offered venison at a discount again, this time cuts best suited for boiling. À la Nelson? Why? Well, it’s slightly complicated. There’s a classic Swedish dish, the name of which translates to ‘sailor’s beef’. 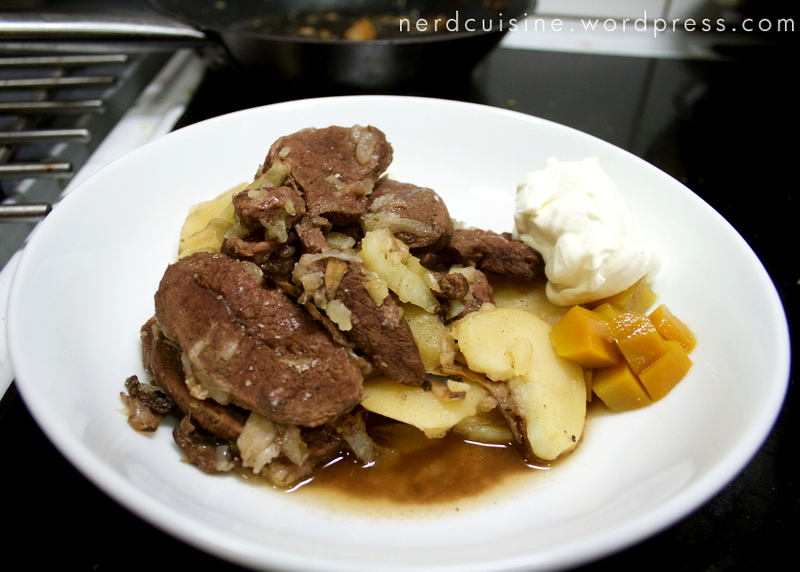 It’s sliced beef, onions and potatoes, stewed in beer. The sailor connection is supposedly that it’s practical to cook everything in one pot on a ship and fresh water isn’t always readily available, hence beer. A bit of googling indicates that there’s an English (or Polish) version that adds mushrooms and trades beer for stock. It’s called Steak à la Nelson. Yes, after lord Nelson, of Trafalgar fame. 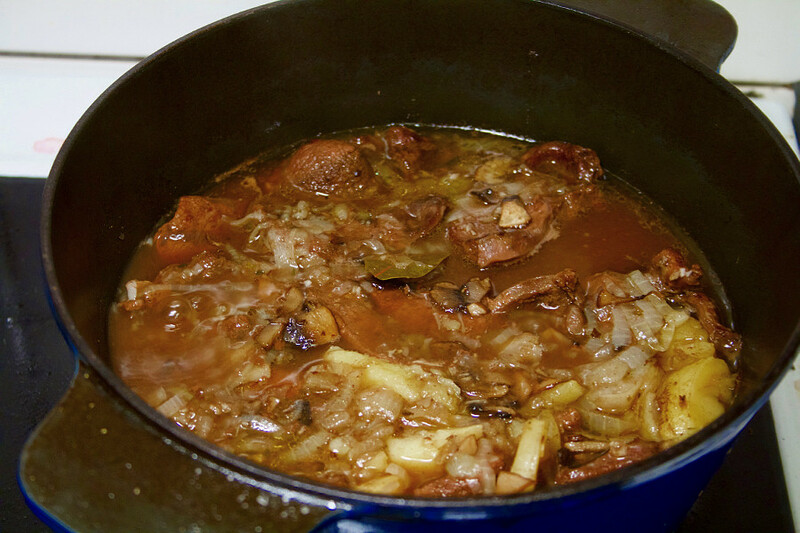 I bastardized my recipe further by not only using venison instead of beef, but also wine and stock instead of beer and adding mushrooms and parsnip. 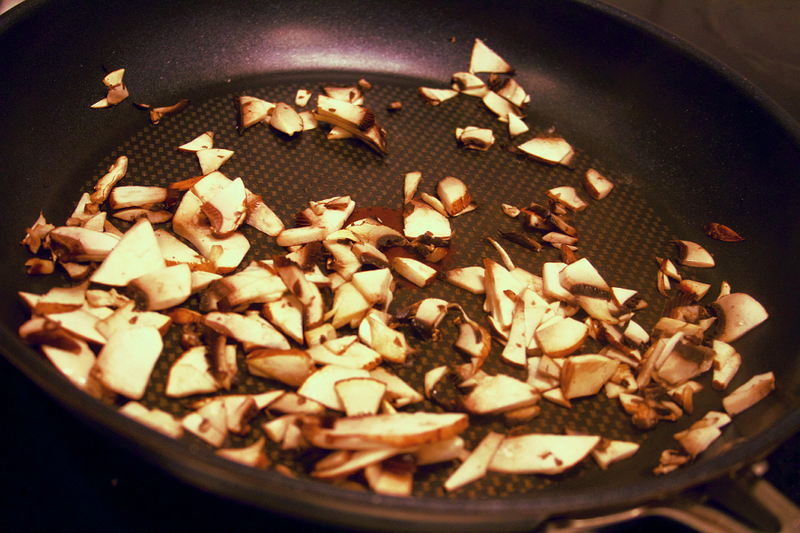 Frying a chopped portabello mushroom. Searing the meat for a more flavoursome stock. Thinly sliced potatoes, onions, browned venison and parsnip in a pot, together with mushrooms, various herbs, black pepper, a hint of garlic and a few juniper berries. 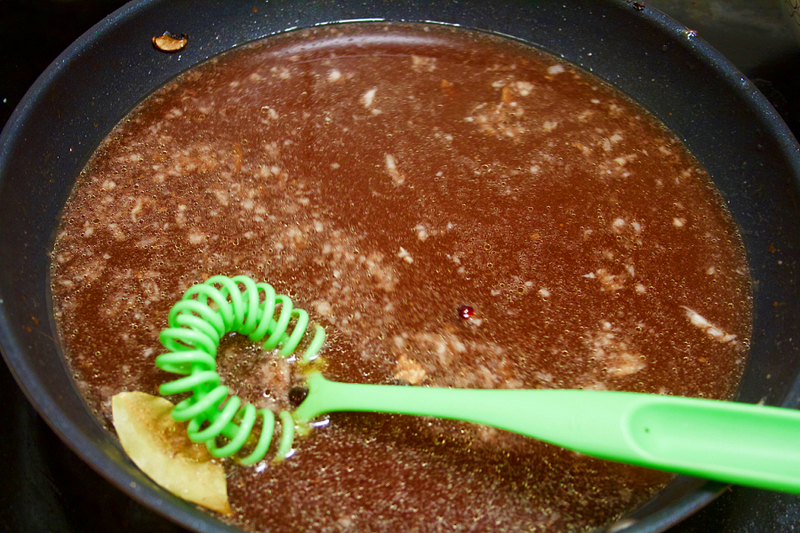 Deglaced pan with wine, stock and bayleaf. After simmering everything for 45-60 minutes it’s not the prettiest of sights, but it’s how it’s supposed to look. All this faffing about with having an actual job or staying at home with the sprogget steals valuable time from food blogging. I’m doing my best to stay above surface, but it’s tricky. As it turns out, the blog turned four last week, which I noticed, but didn’t find time to post about. We’ll have to do with this week instead. The trusty local food grocer announced ground venison at a discount and while patty isn’t my middle name, I’m drawn to the opportunity like a feegle to scumble. (Read more Pratchett if you didn’t get the reference). Venison is typically lean meat, so bacon is always a good addition. 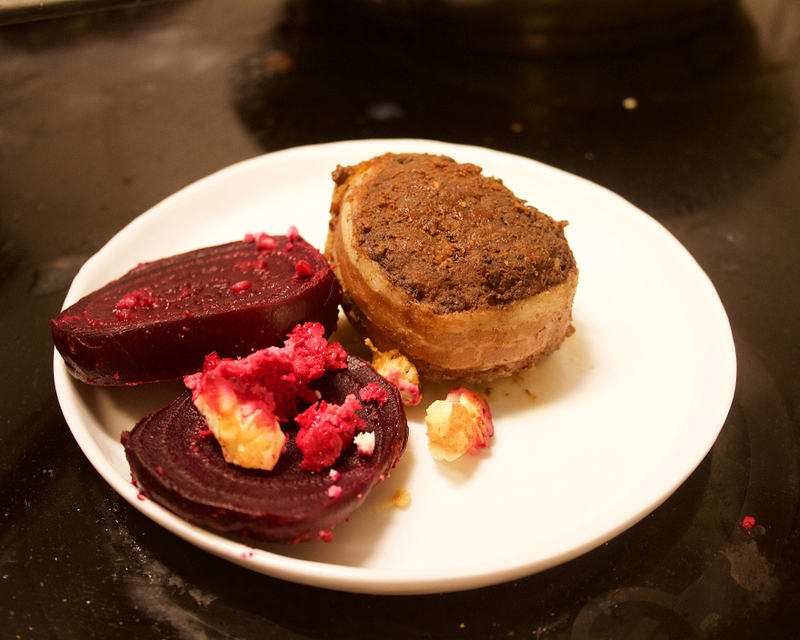 A side dish of Feta-gratinated beets also made their way into the picture. 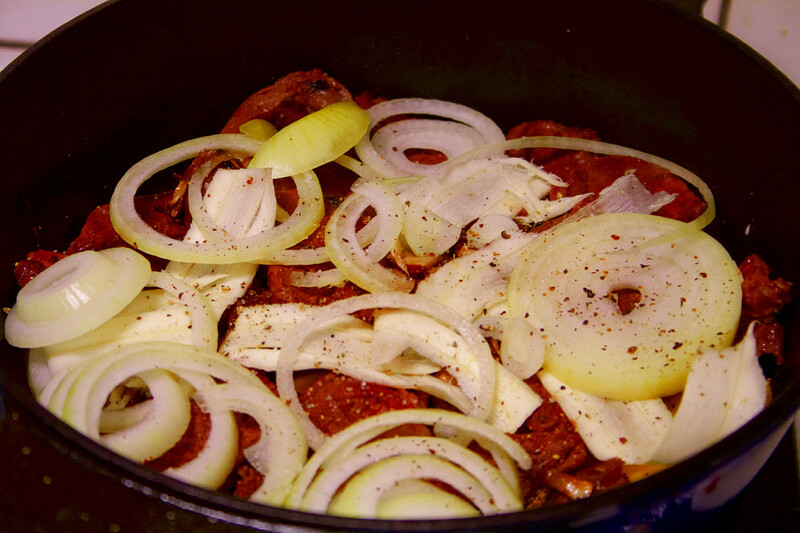 Mix venison with an egg, salt, pepper and possibly a ground up juniper berry or two. Shape into patties and wrap in bacon. Beetroots boiled until soft, then peeled, sliced and put in a dish. Feta sprinkled. Bake until browned or somesuch. Experimentation with garlic, honey, sunflower seeds or the like is encouraged. Sometimes us food bloggers get a bit single-minded about something. I’ve done Japanese noodles, cabbage and bacon, to mention a few. Now it’s apparently pulled pork. In my defense I have to say that pulled pork is very modern and I’m only going with the times. 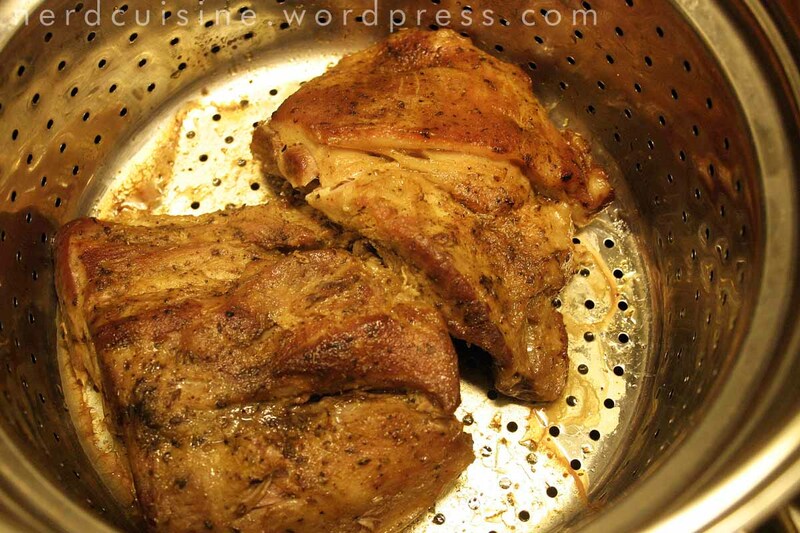 Last time I simply roasted a pork neck at fairly low temp. 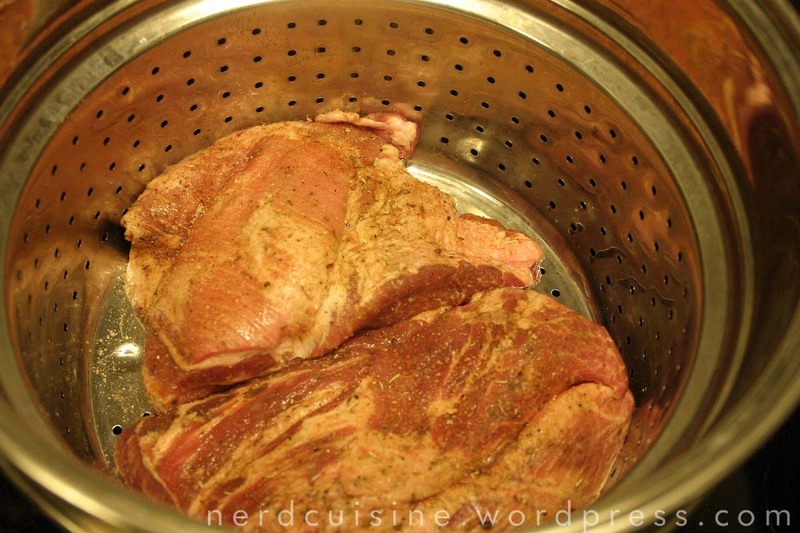 This time it’s been allowed to wallow in its dry rub overnight and the cooking method will be a bit more elaborate. A few years back I was given my parents’ spaghetti pot, because it didn’t work with their new induction stove. The pot comes with its own colander, which I’ve often thought should be usable for large scale steaming. 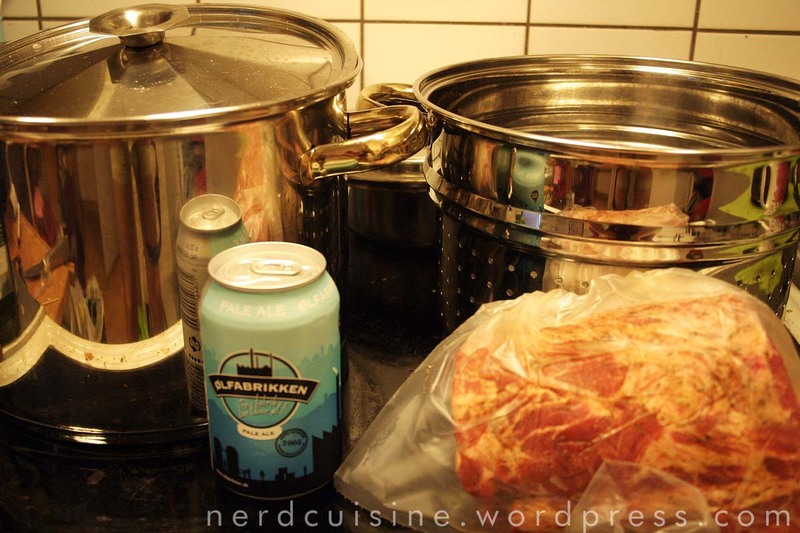 And since the whole pulled pork thing has a bit of a macho air about it we’ll be using beer for steam (More specifically a pale ale from Denmark) Some kind of semi-moist pot roast I guess. 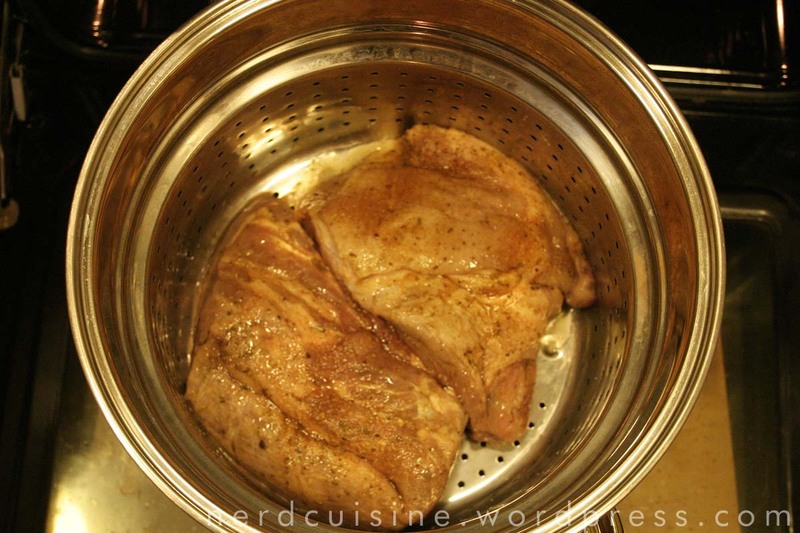 Aforementioned meat (one of many pork neck chunks residing in the freezer) in colander/steamer thingy. Beer goes in pot, followed by colander. Lid applied and the whole thing goes into the oven. In my oven it’s a rather snug fit, so one could probably use the stove too, but oven temp is so much more exact. 212 F in this case. 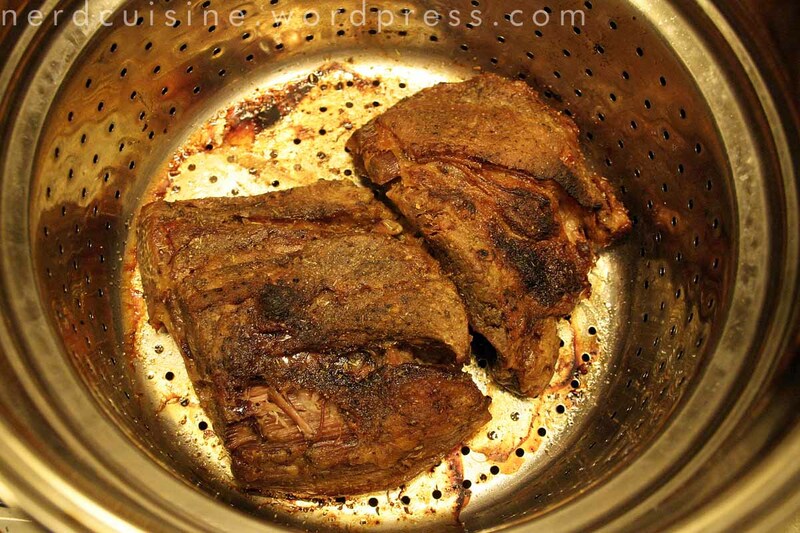 Meat after one hour. It’s showing signs of being cooked, but there’s not a lot of steam going on – more a faint smell of beer going flat. Meat after two and a half hours. Applied a sprinkle of rub just in case. The smell of simmering beer is becoming rather tangible. 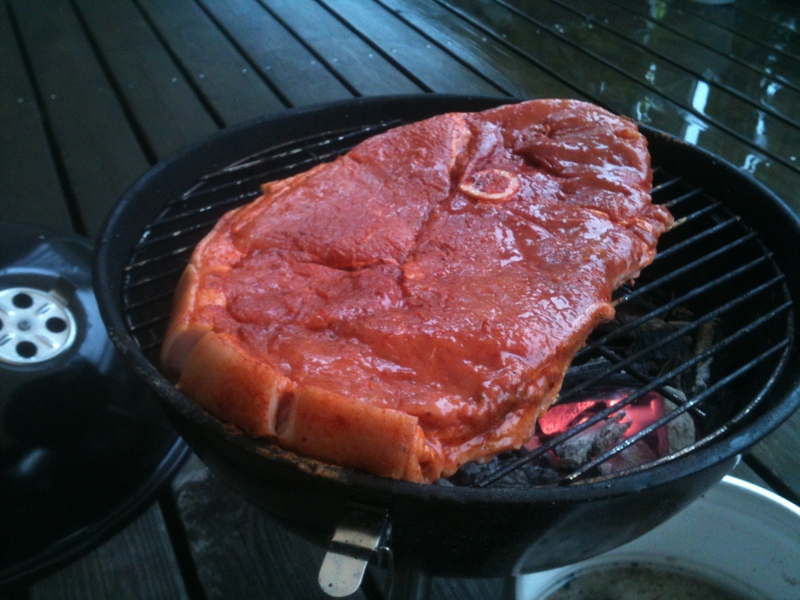 ‘Flintstone roast’ – marinated slice of ham on the bone – is standard bbq fare for Swedes. 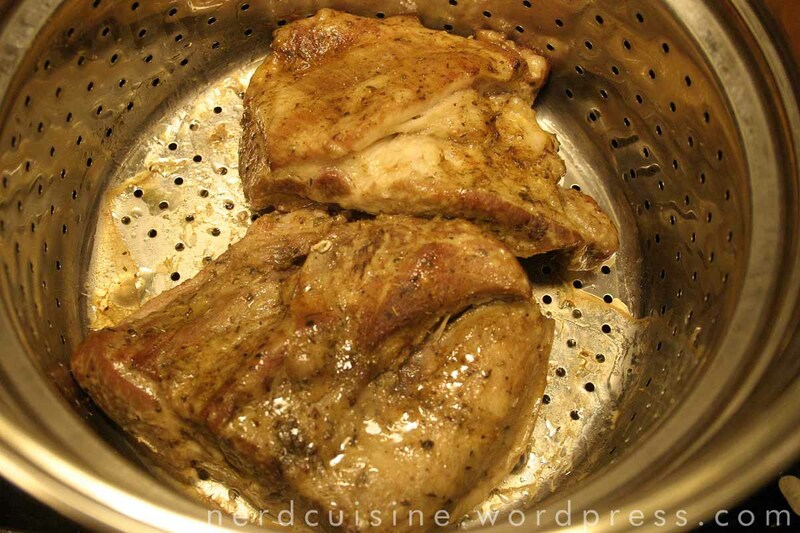 Meat after seven hours. Opening the oven door revealed a considerable amount of steam and the meat has visibly shrunk and is really starting to lose its structural integrity. Satisfied with the level of tenderness I applied another sprinkle of rub and increased temp to 250 F and left the lid off for an hour to get a bit of a bark. 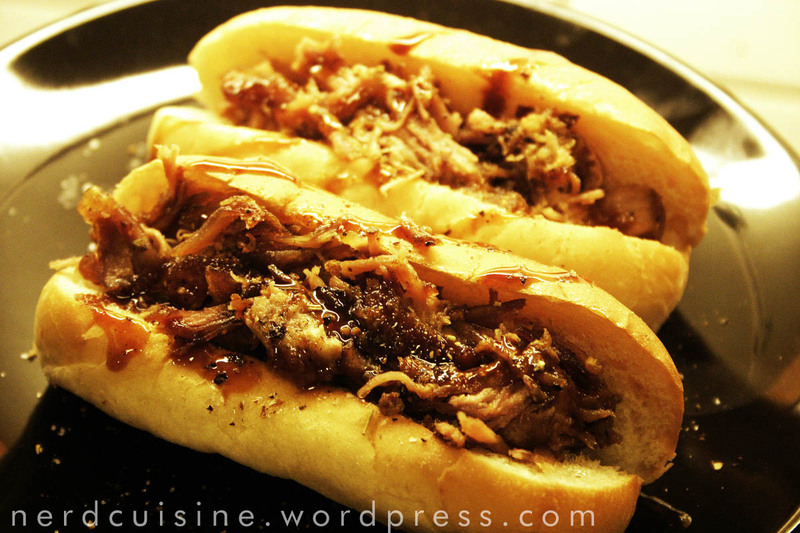 I decided to try this batch of pork in hot dog buns, which works quite well. It’s also worth mentioning that I took my ‘secret’ sauce from the last post and improved it with a bit more mustard, a darker treacle, plenty of dark muscovado sugar and a dash of liquid smoke.